This composite image is an intergalactic "weather map," showing the range of temperatures across a group of galaxies. The galaxy at the center is an elliptical known as NGC 5813, which is about 105 million light years away. Regular outbursts generated by the supermassive black hole in NGC 5813 keep gas from cooling down enough to form stars. This composite image shows an intergalactic "weather map" around the elliptical galaxy NGC 5813, the dominant central galaxy in a galaxy group located about 105 million light years away from Earth. Just like a weather map for a local forecast on Earth, the colored circle depicts variations in temperature across a region. This particular map presents the range of temperature in a region of space as observed by NASA's Chandra X-ray Observatory, with the hotter temperatures shown in red and decreasingly cooler temperatures shown in orange, yellow, green, and blue. The numbers displayed when rolling your mouse over the image give the gas temperature in millions of degrees. A notable feature of this image is the relatively small variation in temperature across the weather map, with a range of only about 30% across several hundred thousand light years. Without any sources of heat, the densest gas near the center of the map should cool to much lower temperatures as energy is lost because of radiation. However, outbursts generated by the supermassive black hole at the center of NGC 5813 provide heat, preventing the gas near the center of the galaxy from cooling to such low temperatures. This decreases the amount of cool gas available to form new stars. This process is analogous to the Sun providing heat for Earth's atmosphere and preventing water and water vapor from cooling and freezing. How do outbursts generated by the black hole provide heat? Powerful jets produced as gas swirls toward the black hole push cavities into the hot gas and drive shock waves -- like sonic booms -- outwards, heating the gas. 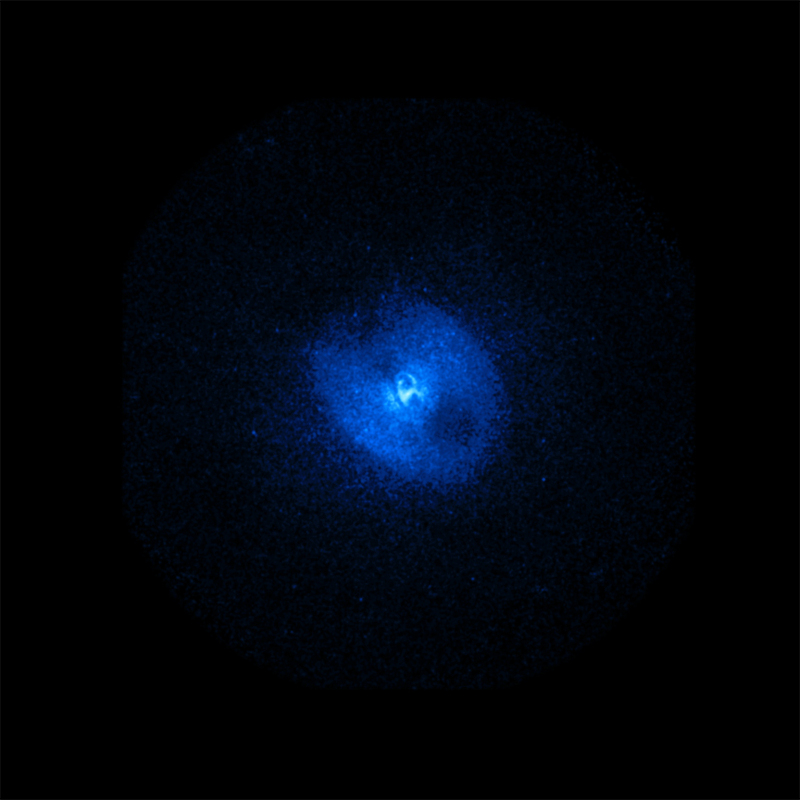 The shocks from the most recent outburst, which occurred about 3 million years ago in Earth's time frame, show up as a "figure eight" structure at the center of the image. This is the first system where the observed heating from shocks alone is sufficient to keep the gas from cooling indefinitely. These shocks allow the relatively tiny black hole to heat the huge area surrounding it, as shown here. 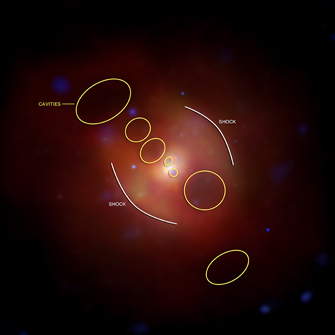 The gas around NGC 5813 shows evidence for three distinct outbursts from the black hole, which occurred 3 million, 20 million and 90 million years ago, in Earth's time frame. The average power of the two most recent outbursts differ by about a factor of six, showing that the power delivered by the jets can vary significantly over timescales of about 10 million years. A paper describing these results has been accepted for publication in the Astrophysical Journal. The first author of the paper is Scott Randall from the Harvard-Smithsonian Center for Astrophysics (CfA) and the co-authors are Bill Forman from CfA; Simona Giacintucci from CfA and National Institute for Astrophysics (INAF) in Bologna, Italy; Paul Nulsen from CfA; Ming Sun from the University of Virginia; Christine Jones from CfA; Eugene Churazov from the Max Planck Institute for Astrophysics in Garching, Germany and the Space Research Institute in Moscow, Russia; Larry David and Ralph Kraft from CfA; Megan Donahue from Michigan State University; Elizabeth Blanton from Boston University; and Aurora Simionescu and Norbert Werner from Stanford University. Coordinates (J2000) RA 15h 01m 11.3s | Dec -01° 42´ 07.1"
I wonder how much influence "Space Weather" could have over a planets weather. I'm probably not the first to catch this but just in case in the second bullet point NGC 5813 is noted as being 105 light years away, the "million" was left out. In the bullet "The galaxy at the center is an elliptical known as NGC 5813 which is about 105 light years away"
isn't it 105 millions of light years? This is most interesting. It is interesting to note the slight, variations in the temperatures across the cluster of galaxies. Is this a good example of what the temperature range across the known universe would be? and if one single galaxy would be studied the same way would it show the same range of temperatures of the stars gases, etc. composing it? Thanks, this was most educationally interesting. Should it be bigger 367,000 light years? Our milky way is 100,000 light years wide. One of the most mind opening pictures I have seen. The second bullet under the image needs to be corrected. Overall a fascinating presentation. Wow, thanks all for information. Take care and merry Christmas and a very learning new year. Hi there. Amazing that we can see galaxies 105 million LY away, and to think the photons we see are that old. Quick question, how do we know that the last "outburst" were 3 million years ago when it takes 105 million years to see the photons? Is it that the X-rays captured in this view travel 100 times faster than photons? Superb findings and excellent photos, keep sending such marvels. A cluster of galaxies 105 million light years from Earth. 105 million light years from Earth. 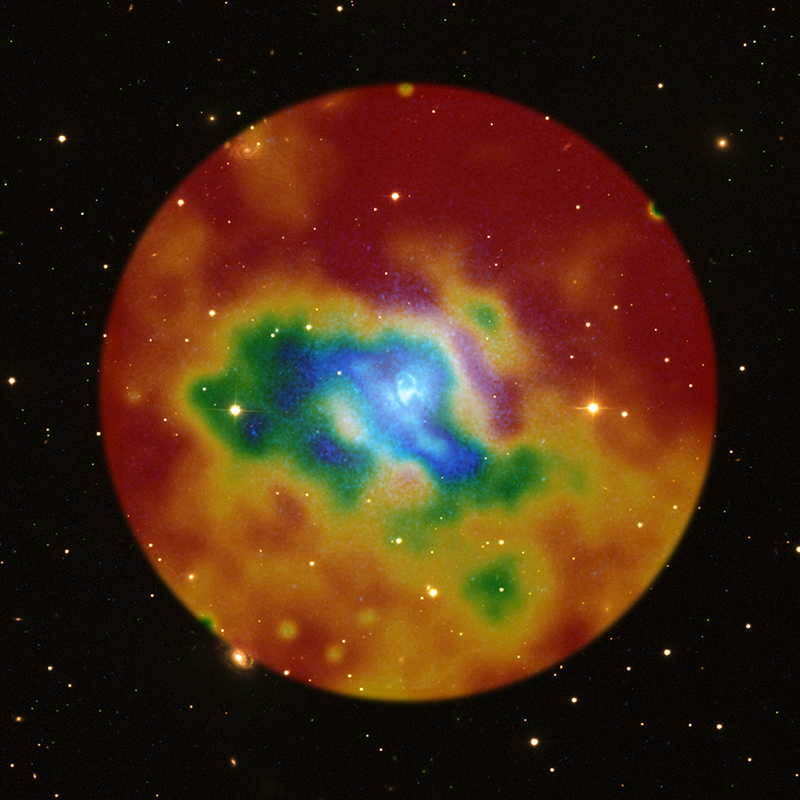 X-rays from Chandra and optical data from SDSS. X-rays are blue, the optical data are yellow and the Temperature Map Pseudocolor: red, orange, yellow, green and blue. In the constellation Virgo visible in both Hemispheres.